Our first run of Snow buddies sent to Moda was printed with the wrong pattern back..Please contact us if you would like us to send you a new back. Or you can print this one here…Sorry for the inconvenience. I am so sorry for all the errors in the LIBERTY GATHERINGS Pattern….We are beside ourselves and can only blame it on the crunch that happens before market…I stitched the 16 applique blocks and I should have personally proofed the pieced block directions, so my fault for not checking them as we published this pattern under Primitive Gatherings…… going forward we will defiantly be doing things different on a collaboration pattern… We thank everyone who has let us know of the errors they found. Liberty Gatherings Corrections–Corrections which may already be in Val’s corrections…width of the wool stems and we didn’t like how one of the stitched words looks so we gave you a new one with better spacing…. Primitive Bride– The pattern should read 3 1/2 yds Primitive Muslin-blocks and borders-by Moda Fabrics-1040-27. We have changed our in stock patterns. 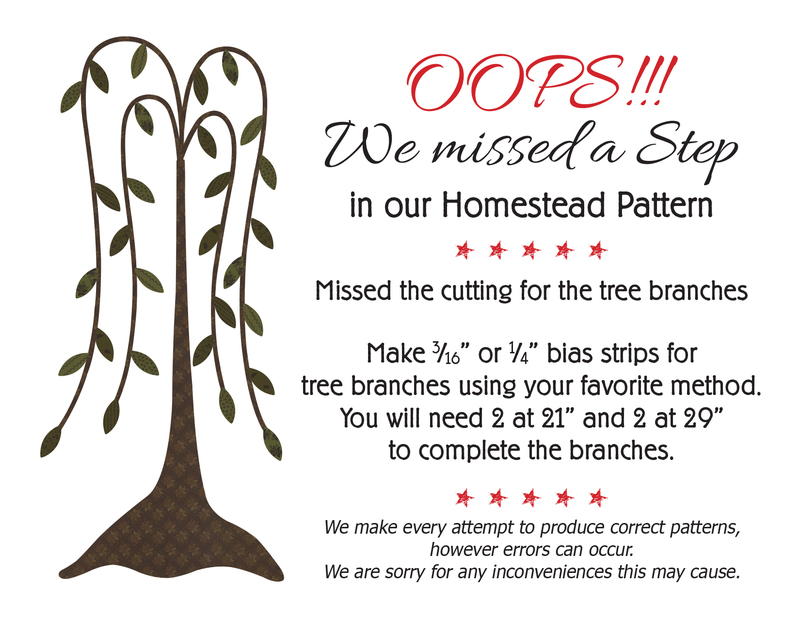 If you have purchased a kit before October 31 2012, your kit only has the 2 1/2 yds in it. You will need 1 more yard. We did not charge for the extra yard in the kit, but if you contact us we will get you the additional yard, provided you can send us proof of purchase- picture of your kit would be fine or something like that. Hi Lettyb…please make sure the kit was purchased from PG and not from another shop….if you are unsure take a pic and we will be able to tell… we will gladly send you one if it is our kit…email photo to primitivegatheringsquiltshop@yahoo.com… we always put homespun backing in all our kits. I just cut my sashing for the Summer Holidays quilt in your Summer Gatherings book. Unfortunately I believe that the cutting directions are wrong. My blocks are 14.5 inches and I think that is correct, your book says they are 13.5 and it tells us to cut sashing 5 x 14 inches – 1/2 inch too short! 😦 Is it me??? Oh sorry – I guess that I’m wrong. Must have one stretchy block from ironing. Seems okay at 14. Guess you figured it out before I got this message…and yes.. 14 is correct…Happy Stitching! I recently purchased your pattern ” A Little Northwind” and in the cutting directions you have us cutting 2″ strips. The supply list calls for 1″ finished size triangle thangles, but that leaves 1/4 ” overhang on either side of the thangles strip. Should it have read 2″ finished size? Maybe I am doing something wrong but the Pinwheel Garden pattern calls for 1 1/2″ finished triangles on a roll. I purchased that size but it is way too big for the 5″ squares I bought at your shop. Is the thangle size correct or am I doing something wrong? Is the pinwheel pattern the one from June ’11? if so, I love it and would love to get the pattern. Where can I get the Settler’s Trail pattern? could you make a pattern for your tree skirt with stars on it? It would be fun to make. if someone else made that pattern could you please me know. Thank you and A happy New year to you/! I recently purchased Summer Gatherings and a kit for the blue bird table runner. Are the birds supposed to be blue? There was no blue wool in the kit and on the side bar in the book, there is no listing for any blue (it is also the onlly pattern with wool that didn’t list what the colors were used for). I can certainly fill it in on my own but was wondering if that was intentional. All I can say about the threads is that carole wrote/stitched that pattern and maybe forgot to include them??? In Lancaster, PA, at the APQS Quilt show, I purchased the Nine-Patch Gatherings book and a pack of 3 1/2″ light and dark repro fabric (100 prints). I was told that the fabric was enough to make 5 of the patterns in the book, but I didn’t write down which five. Can you please let me know which five patterns? I’m confused. The snowflake garden pattern says that the hst units should finish at 3-1/2″. How can that be if we start out with 3-3/8″ squares? Also shouldn’t the hst unit finish at 3″ to match the other 3″ cut whole squares. Help! Middle Child bonus project coming soon? Yes…it is all ready I just have to post it….when I return from Des Moines it will go on…thanks for asking and being patient with me and how busy we are! impacted, and ave come with a lifetime guarantee against breakage. can take it down and erect it wherever he wants. 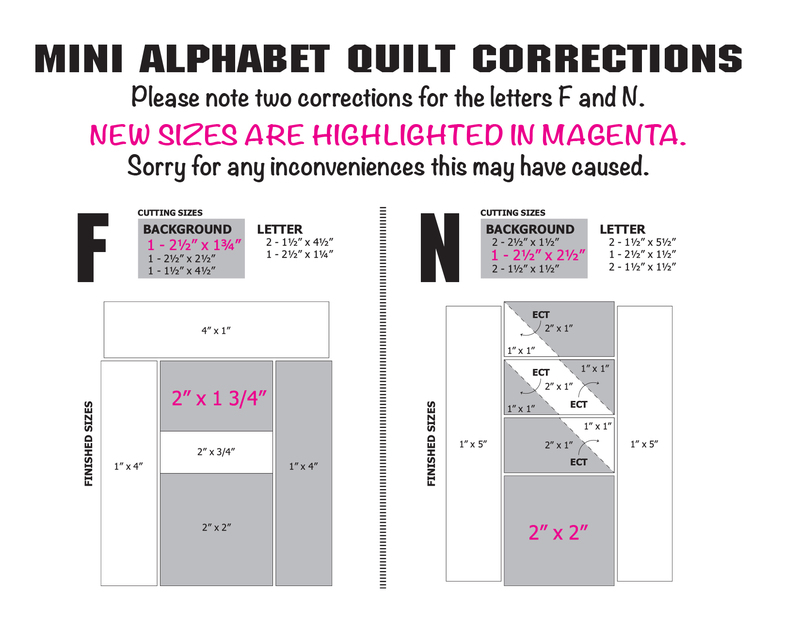 I purchased the Primitive Gatherings Mini Alphabet Quilt I am doing some wording on a quilt and have discovered two of the alphabet patterns to have a mis measured piece in the pattern. I didn’t notice anyone catching errors in Corrections To Our Patterns. Patterns F and N are incorrect I think. Please double check me, and in the meantime I will continue make words. Any possibility of punctuation and numbers in a pattern? of all mates on the topic of this paragraph, while I am also zealous of getting knowledge. i am putting “Be the good” blocks together.. The borders instructions say to cut 2 1/2″. the pic says 3″. 3″ is correct because i will have to cut down my vase or really pay attention to placement to get it to fit in the border. Hi Lisa ! I have a question about the “Garden walk table mat” (from the book “Summer Gatherings) : is it a perfect circle ? I have drawn the scalloped pattern on fusible web, but it’s not round. There’s a difference of about 1 inch (a little less) between the two borders of the pattern. Did I make something wrong ? Is there a correction somewhere ? Hi Lisa, I haven’t seen it listed but I think the block of the month for the Primitive Garden (for the month of January) the one that goes on the left hand side, is not to be reversed. Looking at the picture, I reversed the pattern for the other blocks. This one seems to already be reversed. Where do the other 13 HST go? I just purchased your pattern, “A Penny Gathering”, at Road to California yesterday. On the outside it says the quilt finishes at 27″ x 27″; on the inside front cover it says the finished quilt is 72′” x 72″! After doing some quick math, I assume the latter dimension is a typo? Looking forward to starting this project. Are there any significant errors in this pattern that I should be aware of? Lisa. My first time using your patterns and working on Fresh Cut Daisies. Because I am new to this, I don’t know how may strands of floss is needed as I work on this. I used one strand for the blanket stitch but am not sure how many strands to use on the jar lid and words. Help! Your pattern instructions included a look at your blog for any corrections. Can I assume that the pattern entitled Crop Circles dated 2016 has no corrections? Can I still get corrected Block pattern for Magic of Christmas block. 3. I saw it on sight but can’t seem to get it. I am currently working on Colfax County, I purchased the pattern quite awhile ago at your booth at a show but I didn’t see a correction listed in this section of your website so I thought I would mention that the middle layout picture for the star is wrong (top right unit is turned incorrectly)–This is on the page that begins with “making the 24 star blocks”. It is correct in the lower picture and in the photo. Threw me off but caught it before I did any sewing together. It is a beauty of a pattern and I am excited to be done with prep and to be getting ready to sew stars, thanks for your pattern! I am trying to work on kits for the Patriot Pattern. The cutting instructions are different for the dark vs the light and I cannot figure out why. The 13 reds should be the same for the dark and light correct? The “light” on the dark version should be the same cutting and requirements as the “blue” on the light version? But it is not listed that way. Am I missing something or is the pattern wrong? It seems to me like the light version may be the correct requirements and cutting. Thank you! The number of fabrics used is different…I don’t have this pattern with me right now…but I know that we used more lights in the light version than blues in the dark version…does this make sense? Hello! I am starting my Daurmont quilt and have received my first two block kits. Looking at the paper pattern and the circles, “D” measures 2″; “E” measures 1″, and pattern “F” measures 5/8″. The instructions, however, indicate to “cut 9 circles of shape E and F… and the example states: Trace 9 – 3/4″ circles onto a 3″ x 3″ fusible web…Repeat for the larger circles using a 4″ x 4″ fusible and the 1 1/8” circle. Is the drawn pattern incorrect or the written instructions? What size should these circles be? I’ve stopped everything until I receive a response. I don’t see anything listed under your pattern corrections. Thank you. Hello Lisa, I cut out my center block of liberty gatherings after checking pattern corrections on store website and didn’t see any corrections, so proceeded with what was written. Now trying to sew them together I think some of the cutting dimensions are incorrect. I checked your blog and realized there were some corrections. Please check the center tan square dimensions for H – 4 1/2 and red F 51/4 cut diagonal do not seem correct. The red is way too large for the center square. Sorry you are having issues with the pattern, the quilt is beautiful. Thanks for the corrections, appreciate your promptness. Hi Lisa! I am working on my Daurmont quilt and I’m wondering why you choose to use the recommended Steam a Seam 2. I realize there are several options, from using an iron on stabilizer to using nothing at all. Is it just to help the wool pieces adhere for stitching? Does it make a hanging quilt hang better? Does it extend the life of the quilt? I think using a stabilizer makes it difficult to stitch through, and I’m debating whether I like the look of the wool once it’s been ironed because it loses it’s dimensional qualities; it’s flat. I’ve done wool appliqué both ways; I’m just wondering why you use it. Thank you! I am working on the “Perserverance” pattern using the Liberty gatherings charm pack and 21 rows does not come out to finished size of 36.75″! Disapointed it is so short as I was making for a gift . Working on Layers of Fun. 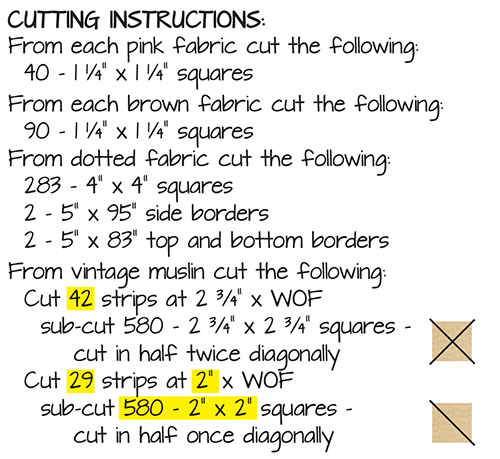 Cutting instructions say cut 4 – 4 1/2″ x 4 1/2″ squares from 10″ squares. Should it be 9″ not 10″ so there is no waste and requiring extra cuts? I have just bought the pattern Daurmont quilt 72 x72 and the wool kit – is there any corrections to this pattern that I should know before starting?? Hello! I bought the pattern Potted Getanium Pillow & bought the threads listed on the back. However the thread required thread on the inside of the pattern shows valdani 12 204 and #8 Dmc 356, not H204 and P8 as is on the back. Please let me know if this will affect the look of the completed pillow,?since I really like the pattern colors used in the picture. I can’t tell which leaf is which (clover, petunia) or if it matters for the flower since dmc is usually floss. Just let me know—thx! Love your wool patterns! Hi Joanne…you must have cut them out inside the hex instead of outside of the freezer paper hex? I just bought a kit from a lady in South Dakota. It is called 2017 Summer Block of the week with 12 blocks. Reading the instructions that were sent with the kit, it mentions triangle papers. These were not in the kit. Can I order them from you or can you tell me the size of them. I live in Kansas and my email is Kclark4800@gmail.com. Thank you for your response. Hi Lisa. I just received the large Candy Cane Ornies and can’t wait to get started. There are no directions. I know I should be able to forgive it out but directions would be nice. Help lol. Hi Renee….I do not know of any problem with block 47…so check the site of the F triangle …maybe it was cut wrong? Hello…I am working on a kit I bought from you this past Christmas. Silent Night. Am working on the center block and can’t see where the size of the large dark triangles are… page 78 of the book…. “Stitch large dark triangles to center block” Thank you for your help!!! Hi…I’m working on “Land of the Free, Home of the Brave”. Started piecing the letters together and realized that the blocks must be separated by background fabric. Did you use 1 1/2 ” strips? And maybe 3 1/2 strips between words? Also, under the “Letter Making” instructions it said to use the remaining red fabrics and background fabrics. I now realize that I should have used only the remaining red fabric. The background fabric for the letters should have been all the same color from the “white print for borders”. I’m kind of new at this and I guess I should know these things…but I didn’t. It’s just that the instructions were so easy until I got to the outside edge. Also, I am assuming that once I get the words together, I will need to determine block sizes to make the whole thing center. Any help would be appreciated. Thank you. Hello – i am working on A Happy Home and cannot find what size to cut the spacers for F and G .
Doreen…I am out of town teaching in Dallas TX..can you call our shop and ask for Judy P and she can find this info for you? I just bought your book “Summer Gatherings” and wanted to make the Garden Walk tablemat BUT I have looked through the magazine several times and there’s no pattern for the 16 flowers that go on it. Has this been corrected and where can I go to get the pattern? Hi Char…no they were not omitted…does it look like there is a page missing? Hi…me again, also no pattern for the scalloped mat for the Garden Walk tablemat. Hope I can find where to get the mat and flower patterns so I can make the tablemat. I just purchased the Columbus pattern and the Square in a Square cutting sizes on page 2 do not match the sewing instructions on page 3. It says to cut 116 – 2 5/8″ cream squares, but the sewing instructions reference using a 2 7/8″ cream square, “make sure this center section is cut accurately”. Can you please clarify which size is correct? Carla… we are gone from the office for the holiday weekend… can you email me a picture of your pattern page(s) and I can figure it out for you? I purchased your pattern Garden Blooms Table Mat from your booth at the Houston International Quilt Show and part of the pattern is missing. Can you tell me how to get the missing pages? Thank you so much. I can’t wait to start on it. Hi…I am sorry Dianne…but we have given you 1/4 of the pattern…and placed few of the designs on it…the rest of the pattern you just place according to the pattern. Thank you for letting me know how your patterns work.